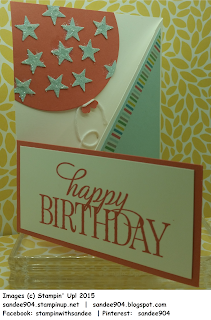 Special request by the Joyner group of ladies…Trifold card challenge! Now I have never made a trifold card before so I went to Pinterest and Facebook for ideas and nothing really seemed, well, do-able. My personal challenge was to use only supplies on hand, which included only using 8 1/2" by 11” card stock, and not use flowers. Here’s my card. Finishing touches. What sets the card apart from others is the Cherry on Top Designer Washi Tape and the Dazzling Details (glitter) on the stars. I think it was a big hit. It is versatile too as you can use any large font sentiment for the front of this card. 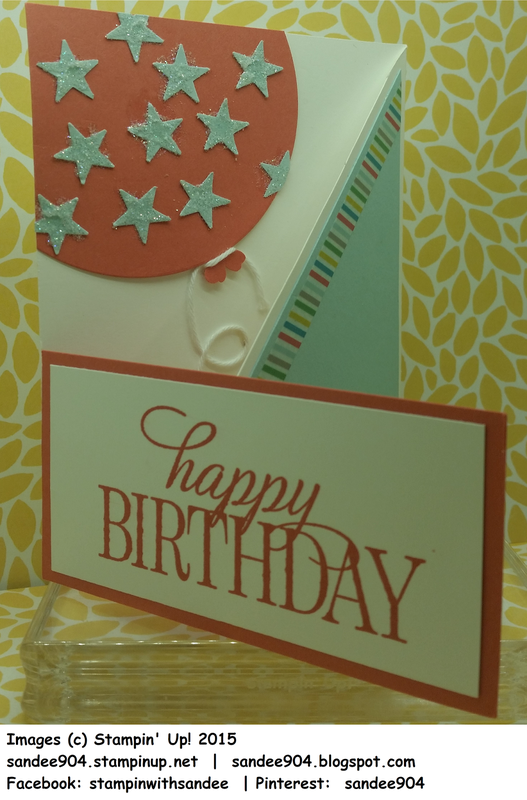 I created a card recipe that I will send you for free with your product purchase totaling $50 or more (excluding shipping/handling/taxes) from my online storesandee904.stampinup.net. My personal offer to send you the card recipe will end on November 30, 2015. Please be sure to check the box that I am allowed to contact you when you place your order, otherwise, I will not have your address to mail your goodies out to you. Love to see your samples. Send me an email.